Would You Rather Be Dead or Public Speak? Do you know it’s true? It was once pretty close to that for me. I can’t say that if you held a gun to my head and made me choose, I’d eat a bullet. But public speaking, and even having a public website, was once a near-death experience. How comfortable are you speaking in public? Not just this formal thing we call “public speaking,” but how comfortable are you standing and speaking to a group? Even socially, do you need the lubricant just to feel more at ease? In business, do you hold yourself back in meetings or other forums because it’s uncomfortable for you? Or perhaps worse, diminish your credibility by doing it poorly? You Know What’s So Bizarre In All This? We’ve been speaking in public most of our lives! And that’s the crux of this public speaking dilemma. Because we see public speaking as a “special-type” of speaking, we think it requires all sorts of unnatural ways of doing it. Suddenly we can’t just speak the way we always do. When you see public speaking is just “speaking,” you can learn to do it naturally, fast. Forget all the books. The teachers. The fake speeches to fake audiences. 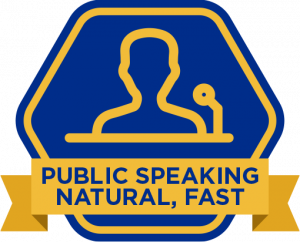 When you have a method for being prepared, you can learn publicly speaking naturally, fast. So on a whim you could just stand anytime anywhere and speak naturally in public. That’s what this Masterclass is about. This is the program I wish someone had built for me. Not just some good ideas on standing on a stage or getting beyond your fears, etc. An end-to-end method that trains you to get good at public speaking, FAST. Track 1: Intro. 5 Massive reasons to learn fast. 3 big mistakes. Getting rid of the scripts and getting natural, fast. Track 2: Preparing For Your Audience. Public speaking is much easier when you stop thinking about you and what you will say, and hone in on how you’re delivering for your audience. Track 3: 10 Principles. Like most things public speaking can be distilled down into a small number of principles for top performance. Track 4: Preparing Yourself. Forget imagining the audience naked, like a pro athlete you want a rigorous routine for preparing yourself to speak. Track 5: Speaking Protocol. It’s easy to speak naturally when you dispense with scripts and have powerful structures for organizing your thoughts. Track 6: Deep Mental Conditioning. This deep learning track deeply integrates in your mind Public Speaking Natural, Fast.